Getting Amazon Prime discounts at Whole Foods Market is as easy as shopping online with your Amazon Prime membership or shopping normally in the retail location. You just have to decide whether you want to shop online or take a trip to Whole Foods. You can shop for Whole Foods items directly through Amazon’s website, but you need to be in one of the areas where Prime Now and Whole Foods operate. They operate in many major metropolitan areas in the US, such as Los Angeles, Dallas, Chicago, Manhattan and Brooklyn. To see what's available from Whole Foods on Amazon, you can visit the Whole Foods merchant page of Amazon. In the top-left of the page, you’ll also see a drop-down menu where you can select your region or enter your ZIP code to confirm your ability to order Whole Foods items with quick delivery via Amazon Now. Getting your Amazon Prime discount at Whole Foods by shopping directly on Amazon this way is easy. The discounts are automatically applied. While shopping for various items, you’ll immediately be able to see the discount prices. You can also shop by department, or look at the weekly specials and best sellers. 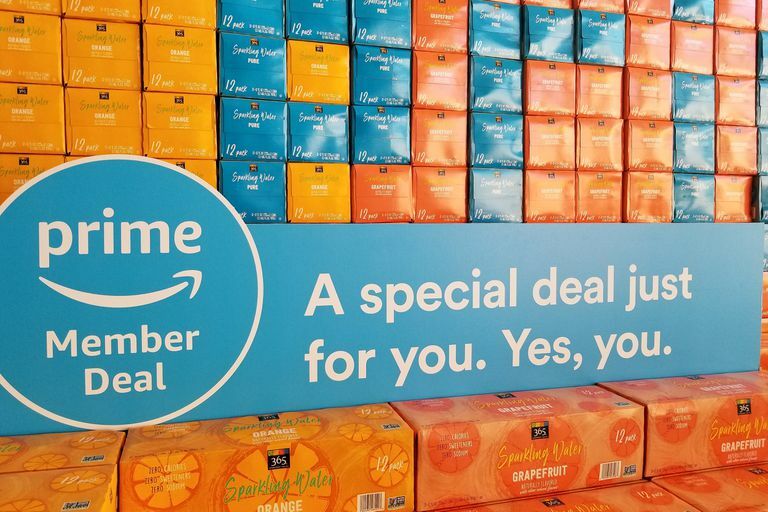 Prime members placing a Whole Foods order for delivery through Prime Now can also enjoy free 2-hour delivery in select cities after meeting a minimum purchase amount of $35. Finally, Prime subscribers checking out with an Amazon Prime Rewards Visa Signature card can also receive 5% back in rewards on these purchases. Getting your Amazon Prime discount at Whole Foods locations may be a bit more involved, but the process is still simple. One method requires you to use the Whole Foods Market app. You can download the Whole Foods Market app for iOS, for Android, and from the Amazon App Store. With the app installed on your device, you’ll be given the option to login. To link your Amazon Prime account with your Whole Foods Market app account, you can simply sign into the Whole Foods Market app using your Amazon account credentials. The Whole Foods Market app can help you locate the nearest Whole Foods location, show you special Prime Member deals that are currently on offer, and also highlight items that Prime Members can buy with an additional 10% discount off of the sale price. When you’ve finished shopping and are ready to check out at the registers inside of Whole Foods, the app will help you get your Amazon Prime discount code. The Whole Foods Market app can generate a QR code for use at checkout. When scanned at the register, this code will apply your Amazon Prime discount. If you don’t see the code on your screen, click on the Prime Code button in the bottom left of the app. If you don’t have access to the Whole Foods Market app or would prefer not to install it, you can still get your Amazon Prime discount inside of Whole Foods locations using your phone number. First, you’ll need to sign in to Amazon using the account with your Prime membership. From there, you’ll need to add a phone number to your account. You can do that by following this link, or select Accounts & Lists in the Amazon navigation bar and click on Your Account in the drop-down menu. On the next page, find and click the box labeled Login & Security. This will take you to a screen that will allow you to add or edit a phone number for our account. With the phone number added to your Amazon Prime account, you can enter your number while checking out at Whole Foods. This will apply your Amazon Prime discounts. But, without the app, you may not know what items are on sale before you go shopping. Fortunately, Whole Foods labels items that are discounted for Prime members. There is a yellow label that says “extra 10% off SALE,” offering an extra discount for Prime members. A blue label that says “prime Member Deal” indicates items in the store that are discounted for Prime members. If you check out with an Amazon Prime Rewards Visa Signature card, you can also get 5% back in rewards points, adding even more to your savings.